ATLANTA (April 12, 2017) – There were many excited Atlantans downtown Wednesday, but maybe none with as much enthusiasm as Brad Nessler. The college football broadcasting legend danced his way to the lectern and paused for high-fives and selfies with second graders from nearby Scott Elementary School, special guests as the Atlanta Football Host Committee (AFHC), in conjunction with the College Football Playoff (CFP), divulged plans for the 2018 Championship Campus in downtown Atlanta. We won’t know for some time which two teams will compete for the title, but the AFHC has made it an absolute certainty that fans will be entertained both during the College Football Playoff National Championship Game on Jan. 8, 2018 and outside the stadium in the days leading up to the big game. At a press conference Wednesday, Nessler, along with President of Atlanta Football Host Committee Board of Directors Dan Corso, Executive Director of the College Football Playoff Bill Hancock and radio personality and Atlanta Hawks Public Address Announcer Ryan Cameron set the stage for what will be happening outside Mercedes-Benz Stadium while the teams prepare to battle. The biggest college football game ever played in Atlanta will be surrounded by seven events and venues that are not only fan-friendly but based inside a compact and walkable footprint. This concentrated area outside the stadium was one of the contributing factors to Atlanta being selected as host. Championship Tailgate Plaza (International Plaza – Saturday, Jan. 6 – Monday, Jan. 8, 2018) – Championship Tailgate Plaza is the gathering place for fans who want to experience extreme tailgating at the CFP Nation al Championship. With three days of outdoor activities, fans will have the opportunity to zip line, participate in free-fall stunt jumps and more. Playoff Fan Central (Georgia World Congress Center – Saturday, Jan. 6 – Monday, Jan. 8, 2018) – Playoff Fan Central is a 300,000 square foot interactive experience that gives thousands of fans the opportunity to be a part of the CFP National Championship. The three-day, family-friendly event includes games, clinics, pep rallies, band performances, special guest appearances, autograph signings and exhibits celebrating college football and its history. AT&T Playoff Playlist Live! (Centennial Park – Saturday, Jan. 6 – Monday, Jan. 8, 2018) – AT&T Playoff Playlist Live! Is the ultimate soundtrack of the CFP National Championship. The FREE outdoor concert series features a variety of national recording artists, including up-and-coming bands and long-time favorites. Media Day (Philips Arena – Saturday, Jan. 6, 2018) – Media Day is free and open to the public. Fans are invited to watch as both teams and coaching staffs participate in media interviews prior to the national championship. Attendees can watch their favorite players while listening in on interviews via free headsets and observe more than 1,000 journalists interact with the teams. Extra Yard 5K (Downtown Atlanta – Sunday, Jan. 7, 2018) – The Extra Yard 5K is the official road race of the College Football Playoff. All proceeds benefit Extra Yard for Teachers, the College Football Playoff Foundation’s primary platform that elevates the teaching profession by inspiring and empowering quality teachers. Taste Of The Championship (Georgia Aquarium – Sunday, Jan. 7, 2018) – Taste of The Championship is a foodie’s dream. Ticket buyers will sample gourmet food and beverages from Atlanta’s most notable restaurants and breweries while celebrating teachers from across the United States. Extra Yard Teachers Lounge (Georgia World Congress Center – Saturday, Jan. 6 – Sunday, Jan.7, 2018) – The Extra Yard for Teachers Lounge is a two-day experience specifically designed for current and aspiring teachers to be inspired, pampered and educated as part of the College Football Playoff Foundation’s Extra Yard for Teachers platform. Teachers will interact with special guests from both the educational and entertainment communities and receive special prizes and giveaways throughout the event. This incredibly high walkability score will surely set the 2018 CFP Championship Game about from its predecessors, a notion that Hancock hammered home. There will be no need to drive to Mercedes-Benz Stadium; it’s a short walk from everything the AFHC has planned. Fans will be able to save money on transit or hiring drivers because there are plenty of hotels and restaurant options surrounding the venue, all within walking distance. 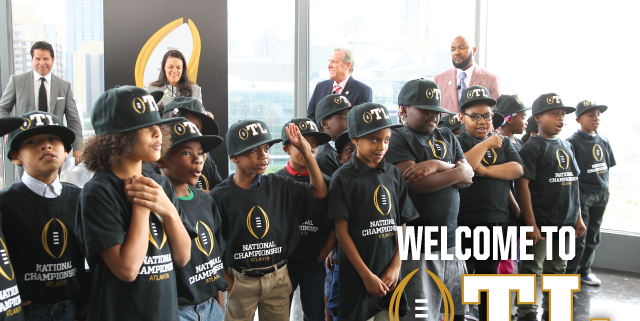 Not only will downtown Atlanta’s compact setting benefit fans attending the 2018 CFP National Championship Game, but as the city learns and grows with each successful event, future experiences will be enhanced. It’s also an opportunity for both the city and the AFHC. The new, world class Mercedes-Benz Stadium combined with the benefits or walkable venues could bring many more future events to the city. The fun will begin on Jan. 6, 2018 but the College Football Playoff National Championship will be just the beginning for championship events in downtown Atlanta.